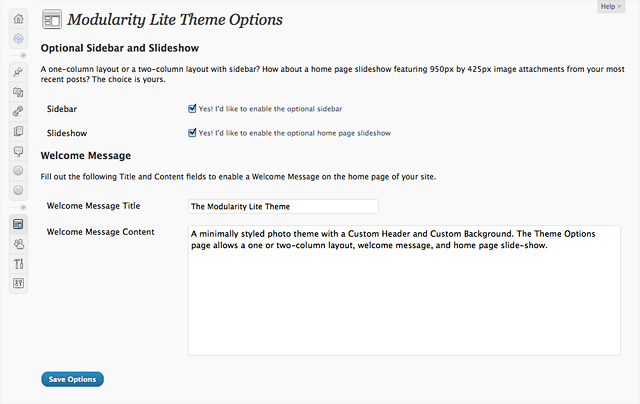 Grab your extra-large images and check out today’s new theme, Modularity Lite. If you want a photo blog or portfolio site our one-hundredth theme might be the perfect thing for you. Let’s take a look at it. We’ve also made sure that Modularity Lite is really customizable. There’s a Custom Header (950 pixels by 200 pixels), Custom Background, and a fully-widgetized footer at the bottom of every page. Check out the Modularity Lite demo and take a closer look. 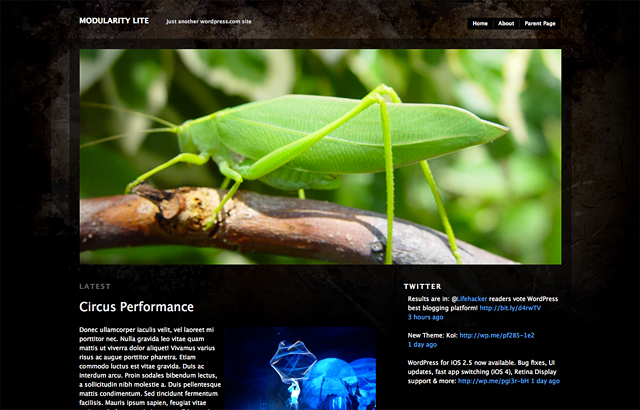 Designed by Graph Paper Press, Modularity Lite is now available for WordPress.com and, for self-hosted WordPress.org sites, from the WordPress.org Themes Directory. This looks great! I need to experiment! Keep em coming guys! Hooray, a new theme again. 🙂 Like this. Happy 100, WP! Another sleek design. Awesome theme. I think this is almost what I have been looking for. Loving Twenty Ten but if I can’t sleep tonight I will give this one a try. Another brilliant theme, will give it a try. Looks very nice … so many fun themes. Thanks! Now this i like! This will work like gangbusters for a unique ‘Business picture blog’ I’ve been ruminating on. Soon, with your help, I’ll rule the world of ‘Graphic Business Pictures for Education in Zimbabwe’. Ok, so maybe it’s a small niche, but still! I really like the slide shows. I would like to see more of those. Are older themes typically updated? I like Vigilance which I am using and would love to see updates to it as opposed to switching around. We do indeed update older themes (Vigilance has customizable menus now, for example) but header slideshows will probably remain a theme-specific feature. That said, if you like slideshows you should check out our new slideshow shortcode for sharing photos in a post. Nice theme. Doesn’t work for me, but can see this being popular. I tried it, it was nice but not for me I’m afraid. I love it. Keep up the great work! Not for me, but still stylish. Way to go on your 100th theme! Can’t wait to see the next 100! Thankyouthankyouthankyou from the bottom of my photoblogging heart! That’s a very nice one with so many customizable features; I am still in love with 2010 and Koi for its neat and old- bookish look respectively. Though, I have checked the slide- show option and that’s wonderful..
You are spoiling us with choices.. Congratulations on exceeding a century.. Cheers..!! This is your best theme ever!! I am going to try this one out. Thanks a lot. Keep them coming! Not exactly what I`m looking for for my photoblog, but it’s a very beautiful theme! Thank you all for providing us such lovely options! Got to try this one later. Nice job. Very nice indeed! Another “if I change from what I’ve got, I believe I’ll give that one a try!” types! Excellent. Pretty simple but looks classy! I can’t get enough new themes. Good work! Wow! I like the slideshow! I love the look and feel of this BIG IMAGE theme! Serving the wide variety of theme tastes is what makes WP.com so entirely special and unique in the content blogging niche. Wow, there’s like a new theme every-other day! The slideshow option at the top is pretty cool, think I’ll try it for my art or photo blog. Keep up the great work! It’s amazing!!! I don’t have proper words to describe my feelings about it! Wow. I might have to tinker with this. LOVE. Congratulations on 100 themes! WordPress has come a long way! I just don’t like the first picture of the post… I hate bugs. THIS IS IT! I have waited for a theme just like Modularity Lite! I am crazy about the large header with slide show capacity. You hit this ball out of the park! Wow. Just wow to the 100th theme you guys have created. Thank you for all the choices! This theme is just awesome for mega images. I may have to start another blog just for the use of getting big time photos up. How much fun is this!!! Thanks guys! This looks great. I’m going to use this theme just for my photos and link it to my main blog. Congrats on 100! Nice!! But for me Journalist that I am using now is just fine. Good for those who use photos more. Beautiful. I think I finally got what I’ve been waiting for. Thanks. Photo blog? that’s wonderful!!! you know what? I have wanted to share my photos ONLY, and I think this is going to be my choice! Definitely using this one. Looks great! Keep em coming. Perfect! Exactly the kind of theme I was looking for! I love that it’s really customizable! Thank you. Best way to present photos. Playing around with this theme now. And Graph Paper Press is known for it’s photo blog templates. Thanks WordPress!!! I love darker colored themes as they’re easier on the eyes and take less energy to display. My current theme (Motion) is very nice except that it doesn’t have a large photo header like this. Very nice. Certainly one of the best recently added themes I’ve seen. I’ve just realized fairly recently that I want to be a photographer, and this will be great for when I’ve started really getting going. Thanks. this would be a great theme for artists I know and am working with! This is fantastic for those with photo blogs. I love the features, especially the home page slideshow! This is not the theme for me, but it is great for bloggers that tell their story with photos. Cool theme…can’t wait to try it out. Love the theme, but if it is truly meant for photoblogging, then there should be an option for thumbnail images to show on the archive page. Ooh! Those are some large images, huh?! Perfect photo blog. It’s good for photographers or people who would like to share their photos on their blog. It’s a nice set up. I’m gonna give it a go, looks great. I like themes that give emphasis to images. Hoping themes for photo blogs would be coming soon. Keep it up, Theme Team! Would have loved it even more if it was a bit smaller like the featured post in the Structure theme. I love the extra large photo box which would be great for my gardening blog, but the background looks dreary. Luckily, the background is customizable. 🙂 You can set a custom image or color from Appearance > Background in your dashboard. This is what I have been patiently waiting for! Thanks guys! Congrats on 100th theme!!! You guys are doing great!!! This is exactly the theme I’ve been looking for. Thank you! This theme is extra ordinary. Normally I’m not fond of dark themes but this theme and settings rocks. Wow, what a great work. Thanks for all of your work and all the new themes. I have to say whole WordPress rocks. Thanks. Congratulations on hitting 100! I saw the homepage a while ago thinking “they need to update it from ‘over 60 attractive themes'” – the WordPress themes have been both quality and quantity, very much appreciated. This is really beautiful. I think I might start a blog for my hand drawn artwork and display it in this! How fabulous!!! Can’t wait to see it put into action!!! Another photo-theme-blog 😦 But I love the modern design. I’m not really a photo junkie, so it doesn’t work for me at present, but it’s very nice. I love black or blue themes. Nice work! Wow that’s look so great.. I’ll try and hope will be better… thanks. At last I have found the perfect theme!!!! Thank you, WordPress. *bowing down towards my computer screen. That would be great for people who want to display their art. Good job! I don’t have any pictures cool enough to put that big on my blog. Yet. I have photoshop so watch out. Wow indeed! I’m so glad that you keep making such cool new themes. That slide show is so nice, i just need time to remodel. It’s so natural.. I like it. Awesome! I’ve been wanting a more “photo-friendly” theme that lets me post more than one photo. Thanks! I love it! Thank you, guys! Really :).